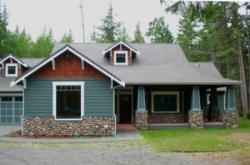 Looking for a custom built home with a great Port Angeles Mountain View? 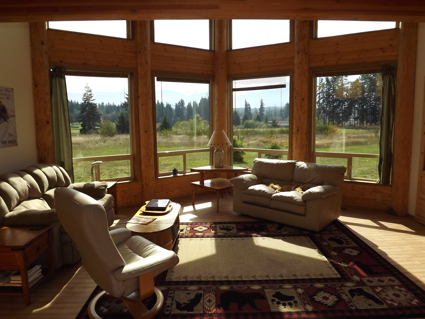 This home is almost midway between Sequim and Port Angeles, and it has a view of the Olympic Mountains. As you can see from the photo below, and in the photos you can view in the link below, this is a home with lots of natural light. The large windows face south and capture the sun all day long filling this home with a warm glow that soothes the soul in stressful times. The master suite is on the second floor, so if you don’t want stairs, this home may not be your dream home, but if stairs are okay, you definitely want to see this home. This home was custom designed and custom built specifically to capture this mountain view. There is a huge pantry behind the kitchen, and you’ll find a loft in the home with room for a reading chair where you can fall asleep, and the wife won’t be able to find you. If you are looking for a Sequim or Port Angeles mountain view, this may be it. 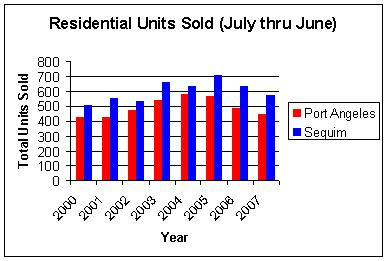 Port Angeles real estate is selling. I’m very pleased to announce the sale of another beautiful water view home west of Port Angeles with a stunning panoramic water view. While this home sits up high on the hill as you can see in this photo, it is still close enough to the beach to hear the crashing waves, a sound that is music to the ears. I wanted to share the news of this sale and a little about Port Angeles real estate just a few minutes west of Port Angeles, because most people don’t compare this area with Sequim. Of course, there are fewer properties like this available out west, and this one is definitely a diamond discovered. For years I have argued that this area just 10 to 15 minutes west of Port Angeles is one of our best kept secrets on the Olympic Peninsula. But the vast majority of retirees have told me either that they want Sequim or that west of Port Angeles is simply too far out of town in the boonies. 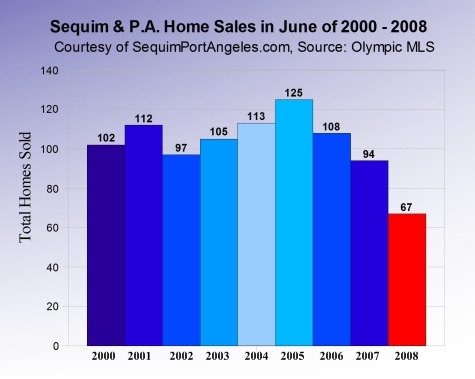 Sequim real estate tends to get more attention than Port Angeles real estate. And if you are a retiree who has been planning to retire in Sequim for many years, and you have fallen irrevocably in love with Sequim, then Sequim it is. This story is about clients who looked at homes in Sequim and after seeing this home, it was the end of the search. I represented this delightful couple from out of town as their buyer’s agent. I love being a buyer’s agent, because I can give my clients 20 years of real estate law experience and many years of negotiating experience as a real estate broker. But the greatest thing is I cost my clients nothing as the seller pays my commission, even though I work exclusively for my buyers against the seller’s interests. You’ve got to love that. I do. My clients do. This home has two bedrooms plus a den, which could be a third bedroom or a guest room, and two bathrooms. It has over 1,900 square feet all on one level with a large garage attached and a shed for yard work and supplies. 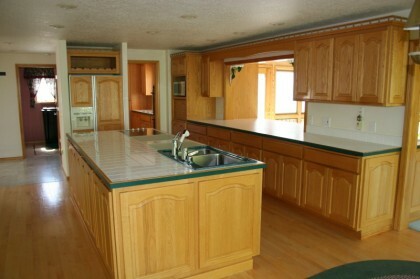 It has a large kitchen with an island with a chopping block surface. The site plan for this home was well planned. You get the idea immediately that this home sits in the perfect place and position on this extraordinary water view lot. The water view is of the International waterway between Washington and British Columbia, and at night you can see the lights of Victoria across the Strait. This is something many do not know about west of Port Angeles–it has majestic water views. In this photo, I’m standing near the hot tub. You could sit in the hot tub with a glass of wine and look out at one of the most beautiful expansive views of the ocean anywhere on the west coast. This home was listed at $399,000, and it sold for somewhat less, but can you imagine what it would sell for on the California coast? Port Angeles real estate is one of the best kept secrets on the west coast so please don’t tell anyone else. Is investing in Port Angeles real estate a good idea, and is the timing right? No, if you buy the wrong house; no if you buy the right house in the wrong area; and no if you buy the right house in the right area at the wrong price. But investing in Port Angeles real estate in this current market could be one of the best investments you ever make. The emphasis is on being able to identify the right home in the right area and negotiating a price that pencils into a good long-term investment. Buying a home as an investment means getting a reasonable rate of return on your money. It means putting hard earned money into an asset that will bring you two things in the future: 1.) a cash flow that is a good rate of return, and 2.) the likelihood of a great long-term appreciation. (Also see my previous article entitled Real Estate Investing and Creating Wealth. Rental rates are relatively low in Port Angeles, so if you get a 80% or higher mortgage, you won’t have a positive cash flow for any houses priced over $220,000, or less. Payments on a mortgage of $176,000 (after a down payment of 20%) at 4.0% (today’s going rate) on a 25 year amortization schedule would mean payments of $928, not counting taxes and insurance. A simple 3 bedroom, 2 bath home with 1,800 square feet in a nice area will rent for $800 to $1,200, depending on the house condition, quality, and location. So it will be very hard to break even or have a positive cash flow for houses above $220,000. Of course, if you pay all cash for your Port Angeles real estate, you won’t worry about getting a positive cash flow, but you still need a home that is very sellable in order to capture your appreciation on the day you do decide to sell. This is a critical element of successful investing. Trying to sell a home no one wants is a disaster, and you might be surprised to learn how many first time investors have made this mistake. In my opinion, this is a great time to invest. Just be sure you stick to the solid principles of investing in your Port Angeles real estate. Port Angeles real estate is a great buy, and most people know this is a buyer’s market. The inventory of homes for sale is large, but the inventory of the best homes in the Port Angeles real estate market is not that big. The market consists of a lot of average, unusual, or mediocre homes for sale and another category of homes: beautiful custom homes in great areas listed at reasonable prices. 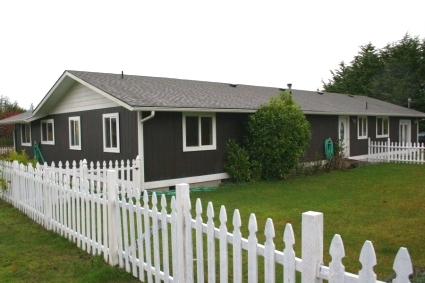 It’s this later category of homes that is selling in this Port Angeles real estate market. Port Angeles real estate is selling to discerning buyers, and there are some extraordinary deals to be had right now. The interesting thing is that the small percentage of homes that are beautiful and are in the best areas and reasonably priced are not going to last. These homes are being cherry picked every single month, and those are the homes I’m selling every month. 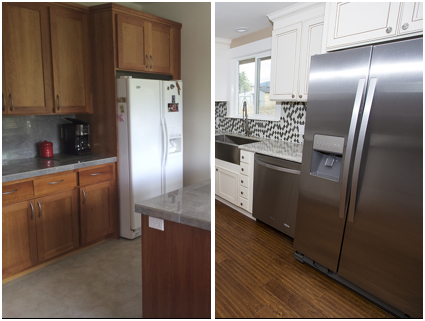 This Port Angeles home is a beautiful custom home with a kitchen you might want to live in. Well, why write about it when I can just show you this video tour. To see more photos and the full listing details of this home, go to Port Angeles custom home and shop for sale. 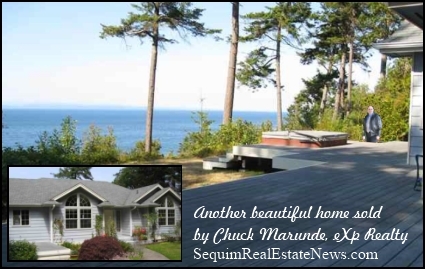 This custom home in the Port Angeles real estate market is brought to you by Sequim and Port Angeles Real Estate and Chuck Marunde. Sellers Unhappy With Their Agents? “More sellers are dissatisfied with their real estate companies these days, griping mostly about the marketing of their home and some of the other services offered by the firm with which they’re working, according to a report released by J.D. Power and Associates this week.” This quote is from the Wall Street Journal’s Market Watch. This probably does not surprise you. There are as many complaints about real estate agents as lawyers and auto mechanics. But I have observed there is an increasing dissatisfaction with listing agents. Why is that? There are several logical reasons. First, let’s get the obvious out of the way. This is the worst real estate market for selling a home I’ve seen going back 30 years in real estate. To state the obvious, it is harder to sell a home in this real estate recession. That’s true in Sequim and Port Angeles as it is in so many parts of the country. It’s no surprise that homeowners who hire a real estate agent to list and market their home are feeling dissatisfied when nothing happens, nothing meaning “the home hasn’t sold.” But there are more substantive reasons so many sellers are not pleased with their agents. There has been a dramatic shift in real estate sales and marketing. Traditional real estate brokerage is struggling with this gigantic change, and many agents are going out of business, not just because the market is slow. The vast majority of consumers readily acknowledge that print newspapers and magazines no longer are the big tools for selling homes. The Internet and powerful technology has changed the game plan, and nearly all buyers are now using the Internet to search for and find their next home. This has nullified the power of traditional sales media. As consumer demand has shifted, tools have been developed to meet that demand, but the super majority of traditional real estate agents have not gotten on board. It is such a huge shift, that agents must re-invent themselves, and you can image how uncomfortable that is for most agents. Consumers may not comprehend the extraordinary changes in sales and marketing that have been taking place behind the scenes, but they do comprehend that something is wrong with a real estate model that uses old methods and old sales language to advertise their home, especially when the results are nil. 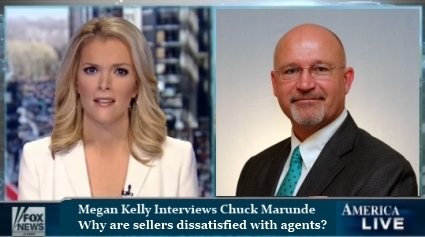 As a result, sellers find themselves dissatisfied with their agents. There’s one other significant reason sellers are dissatisfied with agents and traditional real estate brokerage. We live in a time when all of us have been so thoroughly bombarded by sales pitches all our adult lives, we feel like we can say, “Heard it all before, been there, done that. Not interested. Thank you. Goodbye.” Imagine for a moment that you could meet a professional real estate agent who has made the shift from the old to the new, and is using the most powerful technologies to sell homes today. Is there anything he could say to you that would turn on a light bulb and suddenly give you the confidence to know that this agent knows how to market your home? I can answer question. The answer is, “No.” Let me explain why. People, and I do mean all of us, have become so skeptical, so jaded with sales pitches, lied to by so many sales ads in every industry, that we don’t know how to discern the real thing form the rest of the pack anymore. Let me make the point another way. If a gold salesman came to your home and told you he could sell you gold at a 30% discount over other salesmen, you would most likely send him away politely. Who hasn’t learned, “If it sounds to good to be true, it is,” or “There’s no such thing as a free lunch.” But suppose another salesman came to your door and opened his brief case and showed you a dozen gold bricks that he said he would sell you right then and there for a 30% discount. What would you do? I know what the vast majority of people would do. So skeptical are we that you and I would probably send that salesman packing, too. We wouldn’t trust him, even if he was legitimate. And so it is with Realtors. Most sellers can’t tell the difference between me (and the other true professionals who have made the shift) and the rest of the pack still using the same techniques and sames pitches. But I can assure sellers that there is a vast difference between Realtors these days. Because of the dramatic shifts in marketing, the differences are greater today than ever. Your job is to figure that out. After all, how many days on market do you want your house to sit before the price is low enough to attract some offers? Port Angeles real estate is personified in this gorgeous custom home built on a one acre parcel that is available. Extraordinary custom home, living room with three-sided propane fireplace, vaulted ceiling, formal dining room has oak flooring, vaulted ceiling and French doors to back deck. Gourmet kitchen with designer lighting, custom cabinets and appliances. Master suite with bath featuring heated floor and Jacuzzi tub. Separate shower with heated floor and double shower heads. Library has built-in shelves and pocket doors. There are nice homes for sale in the Port Angeles area, and then there are your ultimate custom homes built not by framers who became general contractors, but homes built by artists who love their work and cannot compromise quality if they wanted to. It’s simply not in their genetic code. 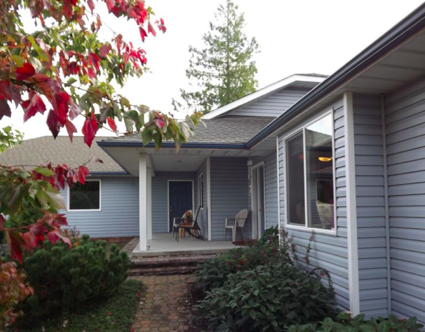 Want a preview of this Port Angeles home for sale? Here’s a little video for your viewing pleasure. Port Angeles real estate in the current market is one of the best values for your dollar on the entire Olympic Peninsula. If you are selling real estate in Sequim or Port Angeles, are you aware of the dramatic changes taking place in real estate brokerage? The way real estate is being sold is changing. Do you know that across the United States traditional full commission brokers are struggling to survive (many are going out of business) and new models with flat rate or discount commissions are springing up everywhere? Why? First, consumers are tired of high commissions and second, according to consumers, they are tired of so-called “full service” brokers who are actually “full commission” brokers rather than “full service” brokers. This is not coming from me, it’s coming from consumers all over the country. The traditional brokerage model ends up costing home sellers too much money because there are too many people involved (selling side broker and his agent, buying side broker and his agent, and assistants, secretaries, etc.). “Too many parties are involved in the real estate value chain — directly or indirectly earning sales commissions, in some cases disguised in fees. This adds expense to the transaction, discourages sales in a low-inflation housing market and creates confusion for the consumer.” See Inman Summary. A logical question for any Sequim or Port Angeles home owner who wants to sell their home would be, “Okay, Chuck, so what are you? A full commission broker or a discount broker?” I am a full service broker who does NOT charge a full commission. I could talk for an hour on this topic. My business model puts clients at the center of everything, and I use technology more than any other broker in Sequim or Port Angeles, but the big point is I only use the most effective means to market a property. I don’t waste money or time on ineffective tools just to try to impress clients. How’s that for blunt and honest? If you are interested in details, email me, and I’ll be glad to share everything openly and honestly. The real estate market and the economy are in tatters. I was going to write next that this isn’t front page news, but it still is. Every day. And next week on November 4th America elects its next President and Vice-President. Who will that be and what will it mean for the real estate market and the economy? Without expressing my personal preference here, I am quite certain the writing is on the wall and next week we will be hearing the title President Obama. Not to get all political on you, but let’s face it, McCain has run the poorest presidential campaign most of us have seen in our lifetimes. And to state the obvious, Obama is the darling of the press, although he has less experience than any presidential candidate in U.S. history. It’s going to be a devastating loss to Republicans, and Democrats are about to take full control of the nation’s agenda not just for two presidential terms, but for an entire generation. Mark my words Joe Biden. We have finally reached the tipping point in America, and conservatism lost. Despite all the passionate talk by conservatives about how they will continue to fight the good fight, and despite Republican strategist Ed Rollins’ claim that “We will be back,” the truth is, in my bold opinion, the nation has finally reached the point of no-return, the tipping point, and we will never go back to what we were. What does all this mean for the real estate market, the stock market, and the economy? Nothing and everything. It means nothing, because despite the debate about what will happen to the stock market and the nation’s health depending upon who wins, the day after every election it is always business as usual. The stock market does not care who gets elected, at least on the surface. On the other hand, who is elected means everything in the long term. Big and small businesses will adjust accordingly, and there are many variables. Obama and his policies scare the daylight out of businessmen, and behind the scenes there will be much ado about everything. The real estate business is in such a state of chaos that it probably doesn’t matter what federal policies come down the pike. It will take a year and a half to two years before there is a semblance of order in the real estate market for sellers. Meanwhile, it remains a buyer’s market, and the election will not change that. Port Angeles, Washington is 15 miles from Sequim, a popular retirement community. Port Angeles is surrounded by the incredible beauty of the Northern Olympic Peninsula, the Olympic National Park, and the Strait of Juan de Fuca. Weâ€™re away from the nightmare traffic of the I-5 and I-405 corridors of the Seattle and Tacoma metropolitan areas. Since Port Angeles is on the northern Olympic Peninsula about a two and a half hour drive from Sea-Tac International Airport, it is a peaceful country setting. Being on the Peninsula, we get less traffic, because we donâ€™t get people passing through on their way from one place to another. We have the beautiful Olympic Mountains and the Olympic National Park with old growth trees in a natural and protected environment. We have the Strait of Juan de Fuca, the Port of Port Angeles, the Port Angeles Boat Marine, and water views galore. We have more recreational activities than almost anywhere in the country, biking, jogging, hiking, surfing, boating, sky diving, mountain climbing, fishing, golfing, incredible motorcycle roads around the Peninsula, restaurants you wonâ€™t forget, and the list goes on. We have more volunteers in various community activities than Iâ€™ve ever seen anywhere Iâ€™ve lived. I was invited as an attorney to talk to a group a while back, and I was introduced to a few people, including a retired rocket scientist (yes, they really exist), a retired CEO of a large California company, a retired Army General, and a wealthy inventor, all of whom were great conversationalist. That was just one little luncheon. There are so many activities, groups, and associations for retired people, I wonâ€™t take the space here to write about them, but youâ€™ll find everything from gardening to building experimental planes. Retirees are happy to find land here where they can build their dream homes. Right now Port Angeles has a large inventory of lots for sale. Of course, the market has slowed down everywhere, and because a number of developers started their projects here several years ago, buyers now have a great selection of lots available, and at reasonable prices. There are water view lots, mountain view lots, high bluff water frontage, gated communities, private acreage surrounded by trees, open farmland for sale, ranch property for sale, and letâ€™s face itâ€“this is a buyerâ€™s market. I am seeing a very significant percentage of our buyers coming from California and Arizona, and all the way from New Jersey and Florida. Many are professionals who know exactly what they want. As between Sequim and Port Angeles, the better value for buyers is undoubtedly in Port Angeles. Port Angeles is a great place to retire. No doubt about it. Use my websites and blogs to read more about Sequim and Port Angeles. See SequimPortAngeles.com. Second, the not-so-obvious. Many people who have put their buying decisions on hold are still looking, and they are scouring the market for what they intend to buy when they are ready. Of course, part of being ready to buy may involve any of several hurdles. For example, many are waiting for their markets to pick up, so they can sell their homes in California, Arizona, Oregon, Texas, or wherevery they live. Some are waiting for that magic retirement date, when they plan to move to Sequim or Port Angeles. For others, there is another trigger, such as a job transfer, and so on. These buyers are still out there, actively looking at the market, but have simply put their action to purchase on hold for now. This demand exists, it’s just below the radar. It is pent-up demand, meaning that when their key event happens (retirement, sale of their home, etc. ), they will be making a decision to purchase here, and they will know exactly what they intend to purchase. I do have hard data for these conclusions, but I need to keep this data confidential. What I cannot tell you with precision is when this will happen. But it will happen. The Sequim Real Estate Blog and Port Angeles Real Estate Blog take a new step today with a major upgrade to our blogging platform, and for one purpose: so you can find us easier and navigate quickly to precisely what you are looking for. 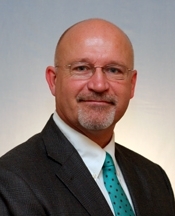 Chuck Marunde, J.D. is please to announce as Broker/Owner of Sequim and Port Angeles Real estate, LLC, that the company continues to be on the cutting edge of providing the best Internet services to clients and the public. No one has the massive Internet presence that we have built. We reach more people, potential buyers, in California, Arizona, Texas, Oregon, Montana, the Seattle area, and all the way to Florida and Massachusetts than any other broker in all of Clallam County. Period. This is why buyers find us, and it is also why sellers want to work with us to list their properties for sale. Today’s market is all about connecting with buyers. That’s what we do. Chuck can be reached by email at chuckmarunde.com or at his cell phone, (360) 775-5424. We love what we do, and so do our clients.